COMPANY PROFILE Ctrip.com International Ltd provides travel related services. Its areas of interest include reservation, transportation ticketing, packaged-tour, corporate travel management services, as well as Internet-related advertising. Ctrip.com is the largest online travel agency in China. The company generates about 82% of sales by serving as a consolidator for hotel reservations and air ticketing transactions. The rest of Ctrip’s revenue comes from package tours and corporate travel. More than 80% of its sales come through websites and mobile platforms, while the rest come from call centres. The company was founded in 1999 and listed on the Nasdaq in December 2003. At the price of USD48.01 as at 29 Jun 2018, Ctrip.Com International Ltd is trading at a Price to Cash Flow Ratio of 26.0 times last 12 months cash flow. 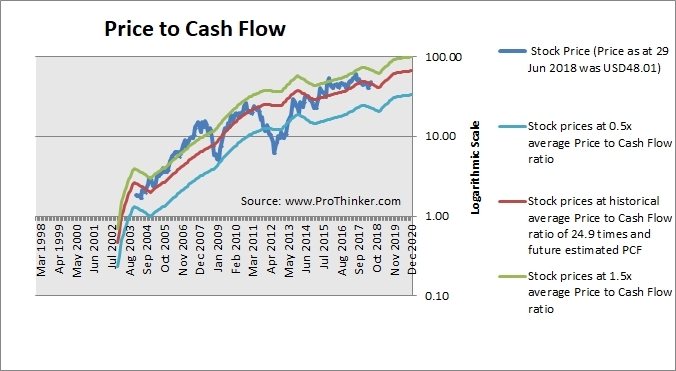 This is a 5.0% premium to its historical average Price to Cash Flow Ratio of 24.9 times.